Accident Repairs & Resprays for all Makes & Models! 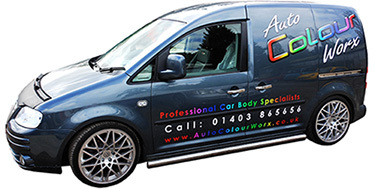 Welcome to Auto Colourworx - We are a Car Body Repair and Car Respray specialist located in Cowfold, West Sussex between Horsham, Haywards Heath and Burgess Hill along the A272. Established in 2004 we have been providing a high quality of vehicle body refurbishment, vehicle restoration and customisation to both private customers and the motor dealer network in Sussex for over 10 years. We only employ highly skilled technical operatives (Porsche Approved) who are fully conversant with the very latest repair methods and techniques. Damaged, cracked or broken plastics on bumpers, spoilers and body kits are expensive to replace and in most cases a simple repair would be much more cost effective helping keep your car looking great and protecting those residual values too! So if you have a daily driver, a track day toy or a cherished classic which needs some care, love and attention - we can help you. We pride ourselves in offering the very best value Car Body Repair and Respray service in Sussex. Contact us on: 01403 865656 or email us through our Quick Contact Form for your FREE Quote!